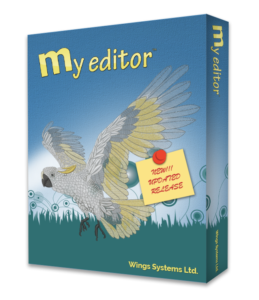 my editor™ is a Free, simple viewing and editing software with some innovative features and functions. It was mainly developed to provide the capability to view and modify supported embroidery files and then re-save any of them in any of the available embroidery file formats. It can be very helpful for any user who wants to make simple changes to his embroidery designs. It will help you view your designs with actual tread colors, make changes and add information in them. Also includes extra browsing and saving capabilities, and tools for better production and material management. Complete stitch editor that allow you to fine tune or even replace the stitches of the design. 1. Make sure that your PC meets at least the minimum system requirements for the software. 2. Download my editor™ by clicking on the link we sent you to your email address. 3. Save it anywhere you want on your hard disk. 4. Open the “my_editor.zip” file and extract the “setup.exe” from inside. 5. Run “setup.exe” by double clicking on the file name. 6. Follow the installation wizard to install my editor™. 7. When the installation is finished you can run my editor™ from its shortcut in the “Start” menu: select “Start > All Programs > my editor > my editor” OR from the “my editor” shortcut on your desktop. Please click here to register. After you have gone through the registration process you will be sent the link to download my editor™ by e-mail. Important: Make sure you submit the correct e-mail address, otherwise you won’t receive the link to download the my editor™.